Its been a month ah? Was suffering from severe health conditions :(.Bedridden for weeks, now getting well. 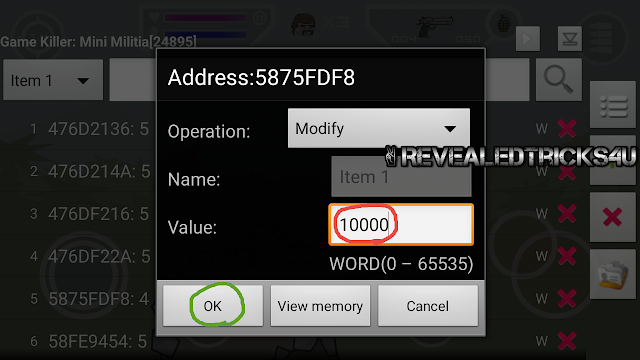 Let's see "How to memory hack Mini Militia - Doodle Army 2(Android)". 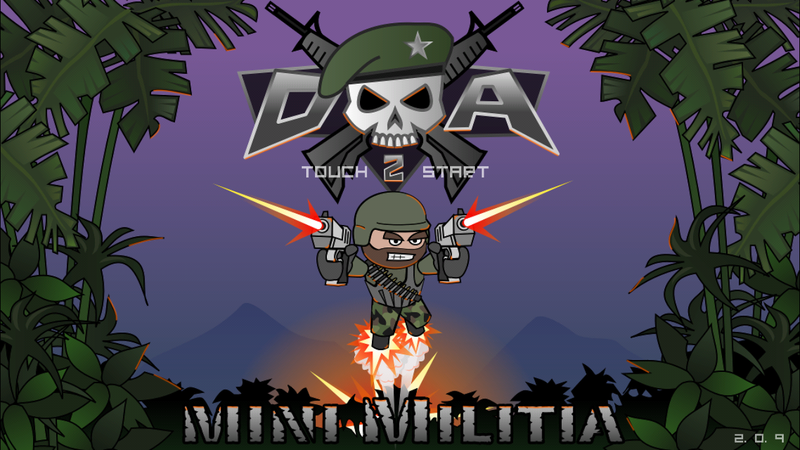 Doodle Army 2 : Mini Militia Experience intense multiplayer combat with up to 4 players online or locally in Multiplayer mode. Train with the Sarge and sharpen your skills in offline Training and Survival modes. You too can enjoy the thrills of spewing hot lead and making swiss cheese of your opponents! Hear the whiz of bullets flying past your face as you tumble for cover. Out smart the enemy with a well placed grenade and watch them explode into bloody confetti. What? Your still not satisfied? Ok then finish it of by repeatedly squatting on your opponents remains and wildly firing into the air. Victory is yours, its all waiting for you! Just press the buy button! DA2 was created based on player feedback and suggestions. Features: -Online Multiplayer via Game Center -Local Multiplayer via Bluetooth or Wifi -intuitive Dual Stick shooting controls -Open world maps -Rocket boots for extended vertical movement -Dual wield with hand guns -Zoom control on various weapons -Melee attacks Weapons:DESERT EAGLE, UZI, MAGNUM, MP5, AK47, M4, M14, SHOTGUN, M93BA, SMAW, MACHETE, PHASR, FLAMETHROWER GRENADES Powerups: POWER BOOST, HEALTH PACK Purchase the Pro Player Pack to get full access to weapons during online play. 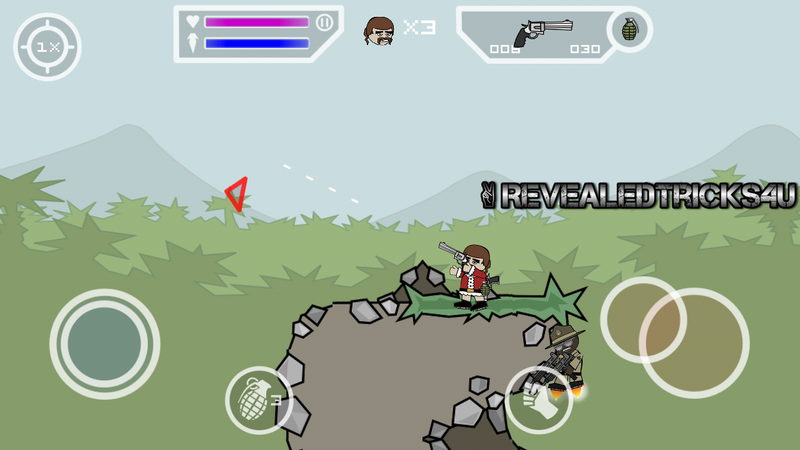 Well the game itself(Mini Militia) - You can get it on PlayStore. Note - This trick will help you get enormous amount of bullets or Ammo for your guns or Grenades, etc. 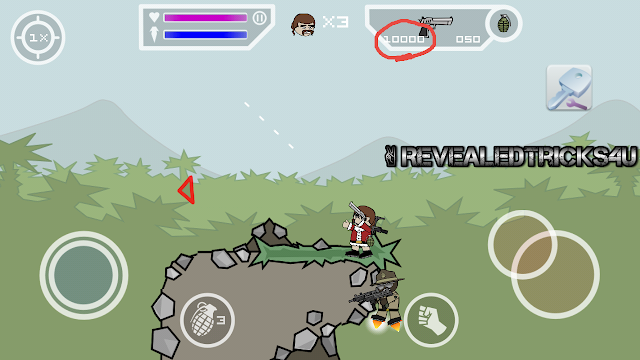 Open the game Mini Militia in your phone and start the gameplay. 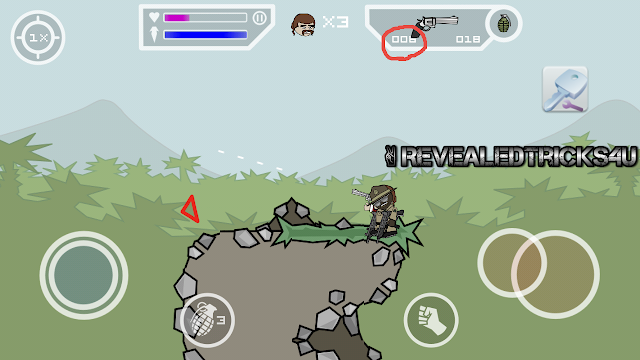 Now minimize the game and open the app GameKiller and get back to the game.You will see a small key like icon on your screen.That is the shortcut to open the GameKiller app while you are still playing the game. Let's start with any weapon that is in your hand.Now note the number of bullets or ammo that left in your current gun by looking at the screen as shown below. Click on the Game killer Icon and enter the value that u got in the previous step.In my game it is "006" and press Search Button. 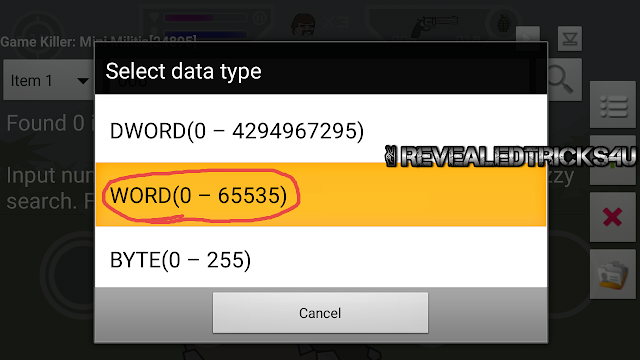 Now in the Select Data Type list, select "WORD(0-65535)". Now it will show the list of memory location which contains the value "006".If it finds a lots of memory location with that value, then it will just show How much items it found in the previous search. 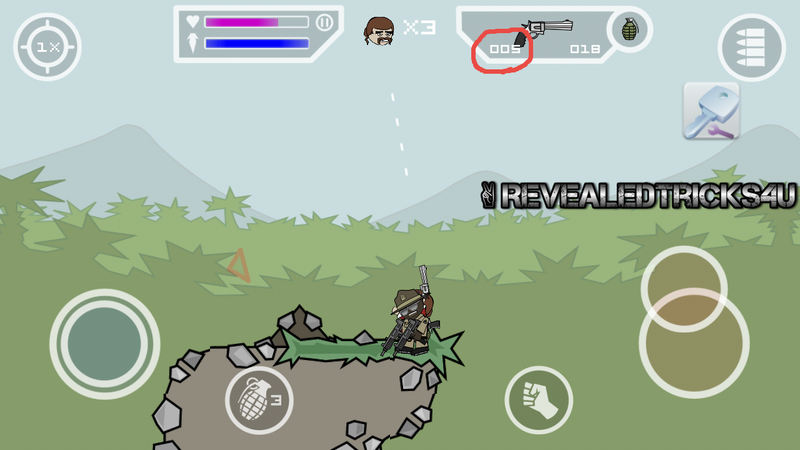 Now minimize the GameKiller app and get in game and shoot your weapon randomly, so that your Ammo will get reduced from the previous value.In my case, I have shot once and got "005" bullets left.Note the changed ammo value. 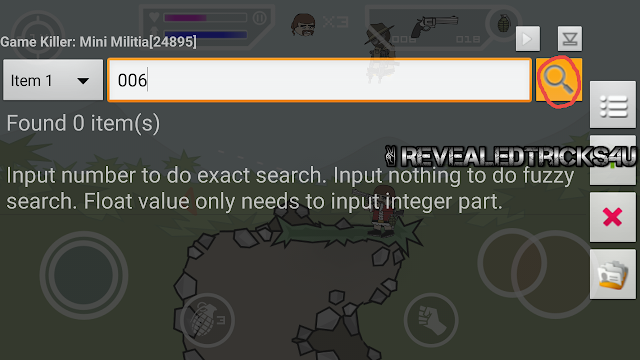 Get back to GameKiller and enter the value.For me its "005" and press Search.Now it will show a small list of memory location with value you have searched for. We still have to find the exact memory location, so that we can alter the value of the memory location to change the number of bullets or ammo.Now minimize GameKiller and shoot once again in game, so that the value will reduce from the previous ammo left.Now for me the value changed to "004".Now get back to GameKiller and scroll the list and search for the list with value "The ammo left in game" which has changed from the previous ammo left.For me changed from "5" to "4". Now there is a surprise left for you, when you come back to game.You will come to see that the number of bullets is the number that you have entered in the GameKiller.Woah!!!!!!!! By following the same steps above, you can hack any weapon or grenades in Mini Militia or any games.Just get experienced to the above guide, you will be automated. Thank me by keep visiting :). AMAZINGLY, THE ABOVE STEPS WILL WORK ON MULTIPLAYER MODES TOO. Please only comment related to this post. I would highly appreciate, If you use this page http://www.revealedtricks4u.com/p/contact-me.html to request anything.